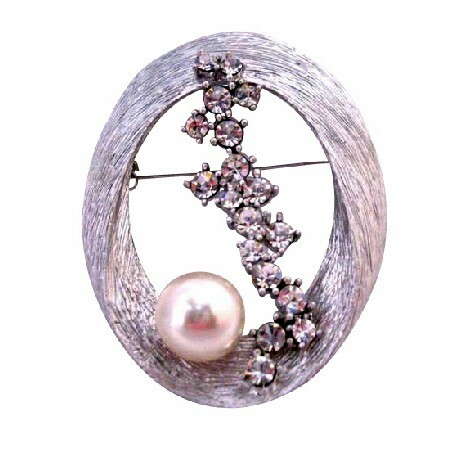 Give every ensemble a feminine touch sophisticated Brooch made with Excellent thin metal wires interwoven in oval shaped decorated with Crystals & Pearls for Wedding cake Bridesmaid Bridal Brooch or dress brooch or for bidal party it enhance the beauty Artistically Silver Casting fully decorated with Crystals Pearls oval broochVERY Sleek Dainty & Sophisticate. Add a dash of drama with a bold eye-catching brooch. this is lovely brooch on your favorite dress shirt scarf or jacket lapel. A beautiful accessory for any occasion. Secures with a standard pin clasp. A great gift idea or an addition to your jewel collection. Pretty & feminine describes this vintage Brooch & excellent crafted Very Elegant.